1. Grab a hearty breakfast at downtown Newport's Whale Tale restaurant. 2. Visit Newport's Oregon Coast Aquarium. 3. Have lunch and beer at the Rogue Public House above the Rogue brewery. 5. Sample more of the Rogue beers. 6. 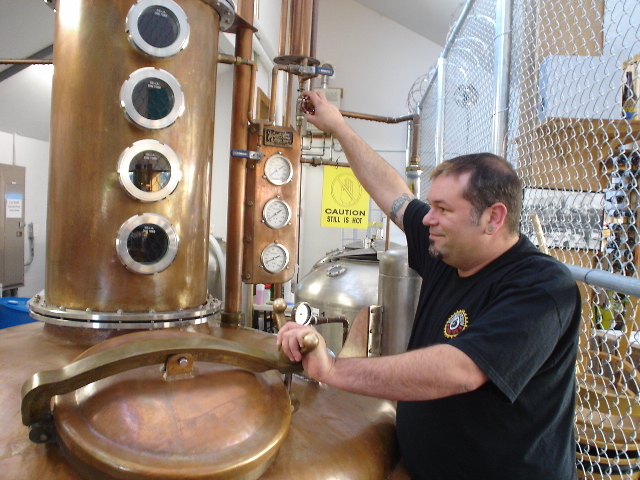 Tour the Rogue Distillery. 8. Check into a guest room upstairs at the waterfront Rogue Public House. 9. Eat great food, drink many beers and chat with the locals all evening at the pub. 10. Walk upstairs and fall into your bed. 11. Wake up the next day and repeat. 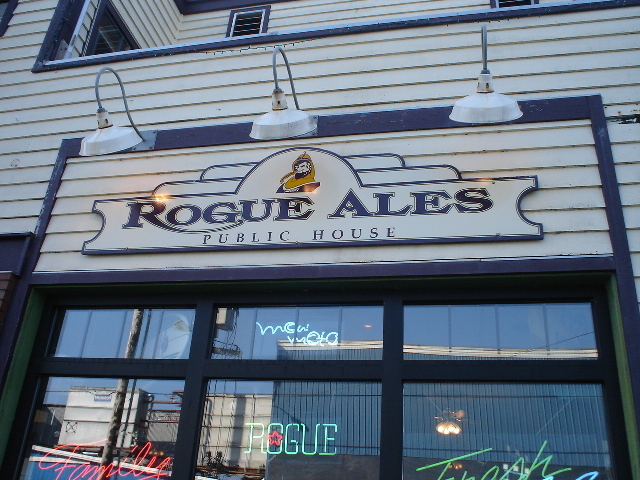 Located in the scenic coastal town of Newport, Oregon, Rogue Ales is a pioneering northwestern craft brewery loaded with personality, vitality and great beer recipes. I've enjoyed the wide variety of Rogue beers since the early 1990s and wanted to visit the brewery since my first sip, but it took me until 2008 to finally make the pilgrimage. I gathered together a group of six beer aficionados from Athens, Georgia, made the flight to Portland, loaded up a mini-van, and trekked down the lovely Oregon coastline toward Newport. Rogue President (and son of the founder), Brett Joyce met us at the brewery and gave us a walk through. Immediately obvious from our tour of the Rogue offices is a definite sense of casual creativity and family that certainly binds the brewery team together. Everyone pitches in with his or her own individual talent, style and roguish nature to contribute to the success of this marvelous brewery. Brett Joyce told us, "I definitely had to work my way up at Rogue. I cleaned kegs, pulled the mash, waited tables at the pub, and then worked for Adidas for ten years. Then one day the Rogue board of directors called and asked if I'd be interested in working with my dad and helping the Rogue team continue our revolutionary mission. I didn't become the company president until recently, so there were no guarantees when I started back in 2006." Rogue cranked out 66,000 bbls in 2007 - made up of 30 different brands. 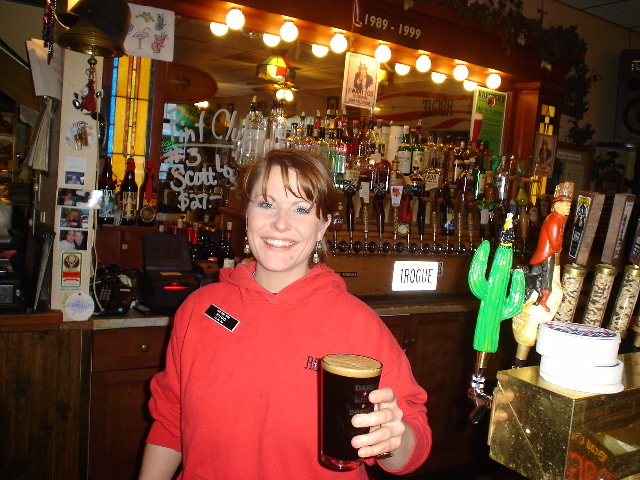 In early 2008 the company also ran eight Oregon pubs - four in Newport and one in Portland, Eugene, Astoria and Portland airport. 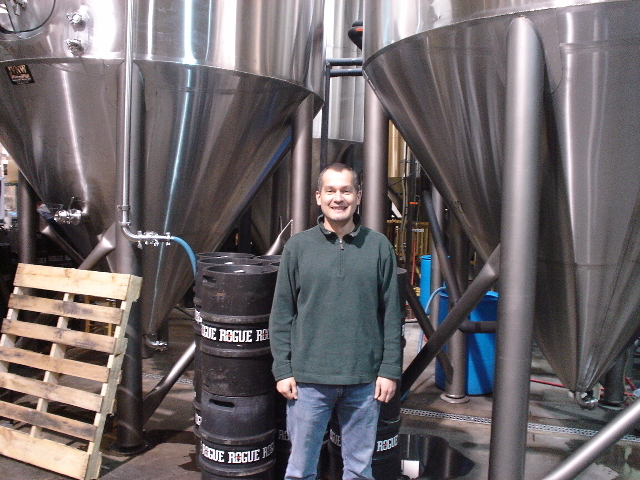 During our Rogue brewery tour, we were quite pleased to meet the iconic Rogue brewmaster, John Maier. John was doing one of his favorite things in the world - making delicious beer. Rogue has recently installed an almost totally automated brew system (John no longer shovels tons of spent grain by hand), but John was still at the tanks watching and controlling the entire process. He took time to speak to us about his love of making new recipes and creating a multitude of flavorful beer brands. He also spoke of his new dog - a Curly Coated Retriever named Mojo. 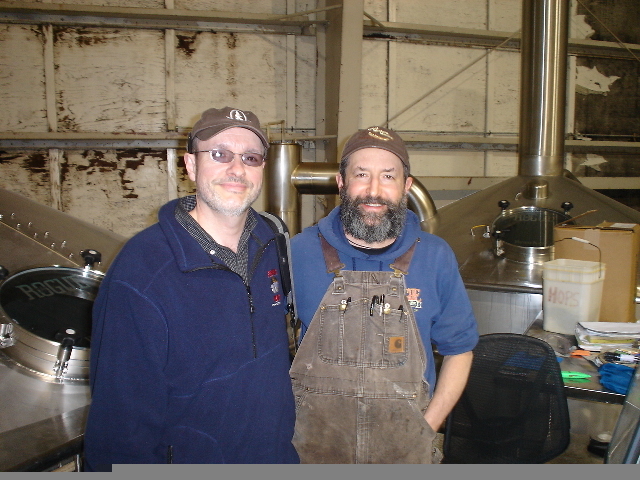 John is truly a gentle, creative genius who has been involved in the brewing industry for over 20 years. "John makes all the beer decisions at Rogue - we really trust his judgment and let him practice his art," remarked Brett Joyce. Brett then led the way to the Rogue gift shop and brewery pub. Happy brewery tour attendees and Newport visitors packed the upstairs pub to sample the hoppy elixirs that flowed from the taps. John Maier even took time off to join the crowd for a pint. Next stop was the Rogue distillery located in a former bait shop just one parking lot over from the brewery. The creative mind behind the distillery (that opened in 2006) is John Couchot, who got most of his experience while moonshining. John shows immense distilling creativity in his use of ingredients such as juniper, angelica root, grains of paradise, orange peel, coriander, ginger, spruce and cucumbers. Rum, gin and vodka emerge from the distillery, and John shows great pride in his pink gin that was aged in red wine barrels. Oh yeah, we can't forget his complex Dead Guy whiskey that's distilled from an unhopped version of Rogue Dead Guy Ale. Our group spent the night in the guest suites found upstairs at the main Newport waterfront Rogue Public House. This pub is a must-see for any hard-core beer lover in the USA - it drips with history, personality, hospitality and amazing beer. Delectable chow fills the food menu as well, with standouts being the hazelnut ale bread, clam steamers, sandwiches, pasta and pizzas. American Kobe-style beef is the base for the pub's burgers, hot dogs and even the Kobe Bleu Balls (meatballs with Oregon bleu cheese). 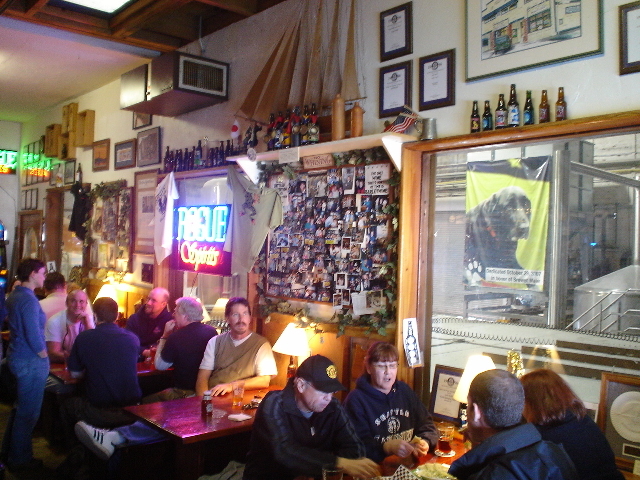 Community makes up an important part of the Rogue Public House, and the local fishermen love the place. 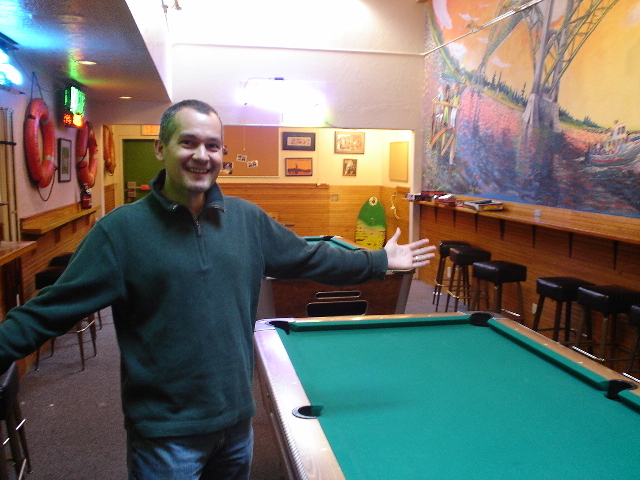 The pub is comprised of a main bar, poolroom (that was once the Rogue brewhouse), patio, card room, and a non-smoking middle room. The upstairs guesthouse offers three large sleeping rooms. Do you want our definition of heaven in Newport, Oregon? Spending an evening enjoying the delightful food and beer at the Rogue Public House and then walking upstairs to your bed comes pretty close. When asked where Rogue Ales will be in ten years, Brett Joyce replied with a smile, "I don't think about it - we barely have a 12 month plan. We're just very busy and proud of our great beers."